Mooncakes, tea and lanterns galore – Mid-Autumn Festival is coming right up next month! And what better way to encourage kids’ interest in the traditional festival than by enticing their tastebuds with yummy moon cakes? We’ve rounded up 18 of the most intriguing mooncakes that will have the entire family over the moon! Making its Mid-Autumn debut with the inaugural Andaz Baked Mooncake Quartet Collection, Andaz Singapore has recreated classic flavours with a healthy twist, for guilt-free snacking all season long. The star of the quartet, the Low Sugar Pandan, is inspired by the hotel’s namesake Pandan chiffon cake which features a traditional lotus paste blended with natural pandan juice. Another highlight is the fragrant Mixed Nuts (Wu Ren) Mooncake, which uses a variety of premium nuts to balance sweet and tangy flavours with every bite – it doesn’t contain lard or pork, which makes it suitable for vegetarians too! 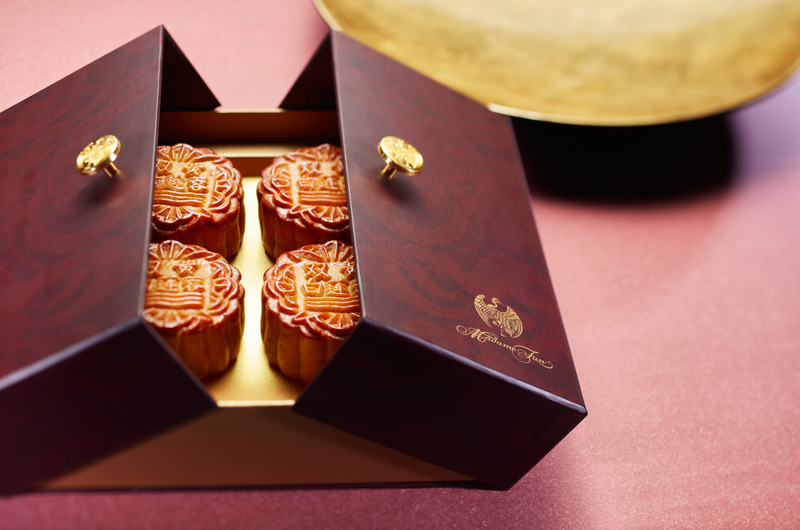 The mooncakes are available for purchase via email at [email protected] or online at andazsingapore.com. It’s no secret that Awfully Chocolate’s decadent Mid-Autumn treats are awfully hard to resist. For starters, there are the chocolate mooncake truffles that offer a selection of white-to-dark choco ensconcing four interesting flavours such as caramel brittle with butterscotch yolk, and white chocolate lemon orange marmalade yolk. The main attraction, the Awfully Chocolate Mooncake Collection encases classic mooncake fillings in baked dark chocolate skin, delivering a complimentary deep chocolate roast flavour. An extra that kids will enjoy is the Fruit & Nut Chocolate Full Moons – five gorgeous flavours varying from caramelised white chocolate with toasted almond & cranberries, to 45% dark milk chocolate with pistachio & sea salt. Just thinking of these delicious mooncakes has us drooling! 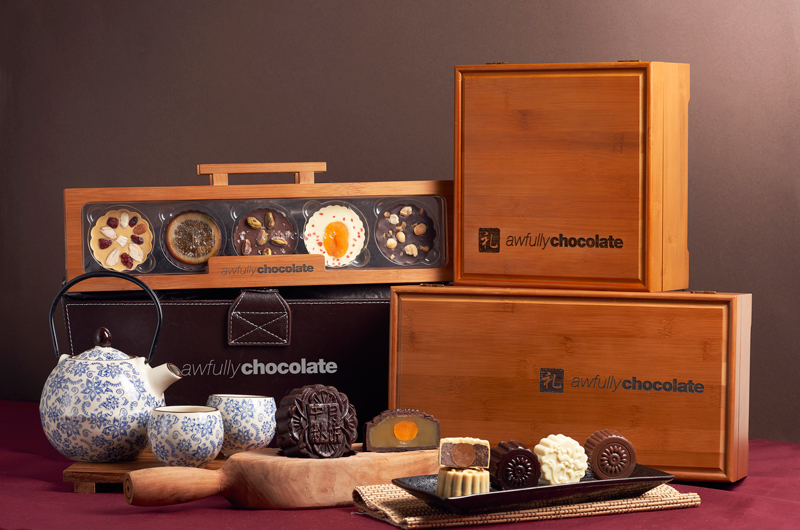 The mooncakes are available for purchase at Awfully Chocolate’s 16 stores islandwide, or online. 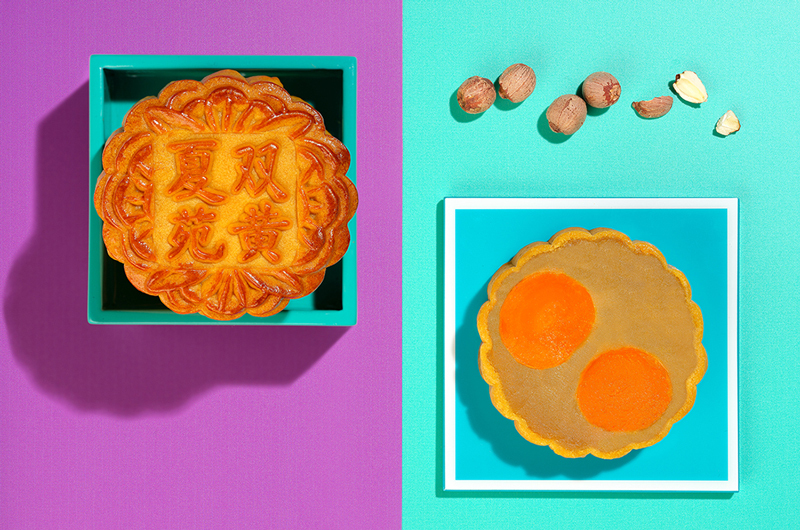 Bakerzin ups the ante this Mid-Autumn Festival with not one but eight whopping mooncake collections! Perfect for families with adventurous tastebuds, take your pick from exquisitely handcrafted flavours ranging from the intriguing Beetroot Gula Melaka (Royal Collection) to the rich Mao Shan Wang Durian Snow Skin (Splendour Collection), superfood-filled Cempedak Chia Seed Snow Skin (Brilliance Collection) to the best-selling Black Sesame and Peanut Butter Snow Skin (Heavenly Collection). Even better, parents looking for a boozy treat should take a bite off Bakerzin’s liqueur infused collection: highlights include Butterscotch Baileys and Latte Kahlua. You’ll love it, we promise! The mooncakes are available for purchase from now to 24 September. Visit www.bakerzin.com for more information. Crystal Jade pulls out all the stops this Mid-Autumn festival with the limited edition Mickey and Friends Musical Carousel Collection. 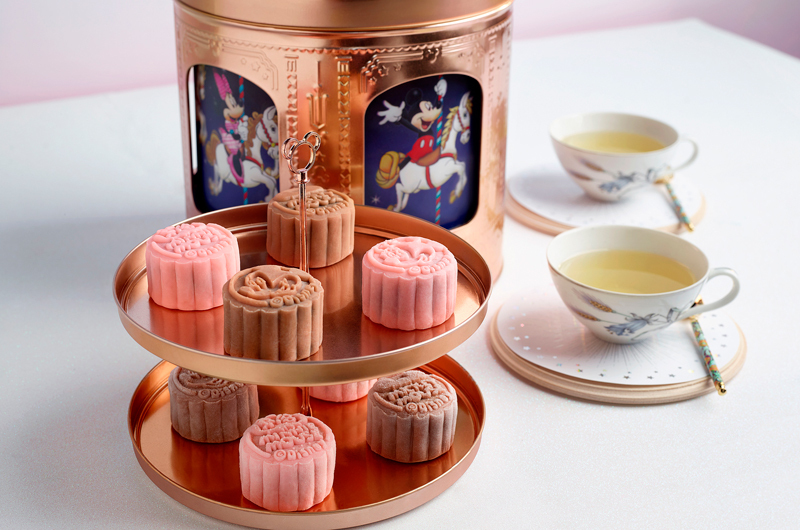 This show-stopping exclusive is the total package: from its gorgeous rose gold-gilded tin box that doubles as a musical carousel featuring Mickey and gang, to its tea time-ready two-tier dessert tray and petite mooncakes in crowd-pleasing Pandan Lotus with Gula Melaka and Chocolate Manuka Honey flavours. No prizes for guessing which collection will be the kids’ favourite! Feng Shui Inn keeps it deliciously simple this season with the Mid-Autumn Star, which features American ginseng blended with custard and white lotus paste, and chocolate pearls for textural contrast. 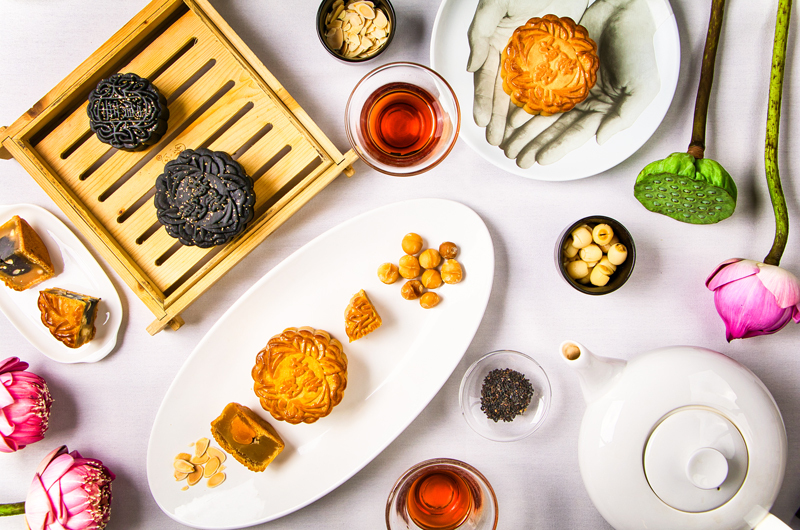 Perfect for pairing with hot Chinese tea, each mooncake contains over five grams of premium quality American ginseng mixed into luscious white lotus paste and custard. 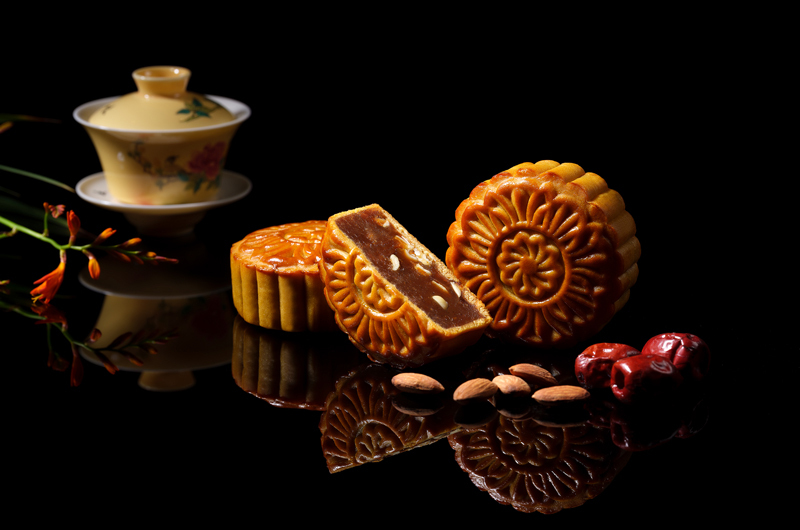 Art lovers will definitely appreciate Goodwood Park Hotel’s gorgeous mooncake collection. 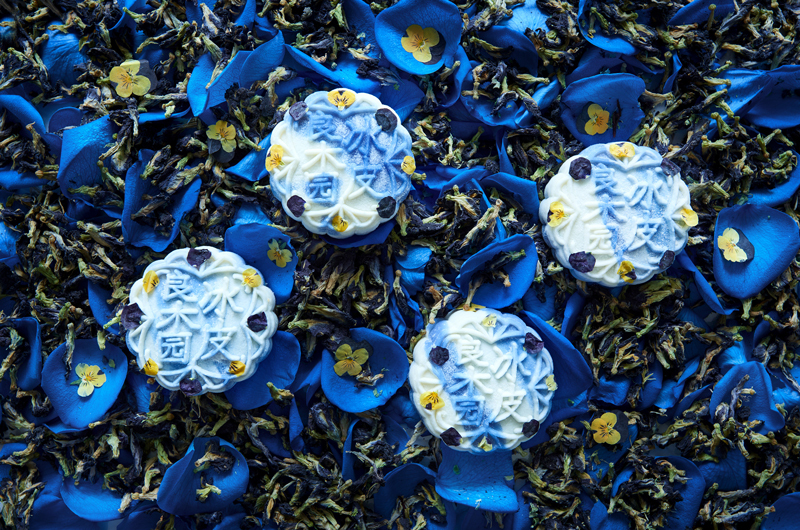 The hotel’s latest addition, the Blue Pea Flower with White Lotus Seed Paste, is a definite headturner, featuring a beautiful natural indigo tinge interspersed with brushstrokes of white. It joins the ranks of other snowskin beauties such as the Almond Beancurd with Longan, striped in patriotic shades of red and white, and the citrus-hued Soursop with Calamansi. You can even use them as visual aids as you regale the kids with Chang’e’s tale – just finish your stories before the mooncakes are all snapped up! The mooncakes are available for purchase from now to 24 September 2018. To order, visit the Deli from 9am to 9pm, contact the Mooncake Call Centre at (65) 6730 1868, or place orders online here. Want an extra icy treat? 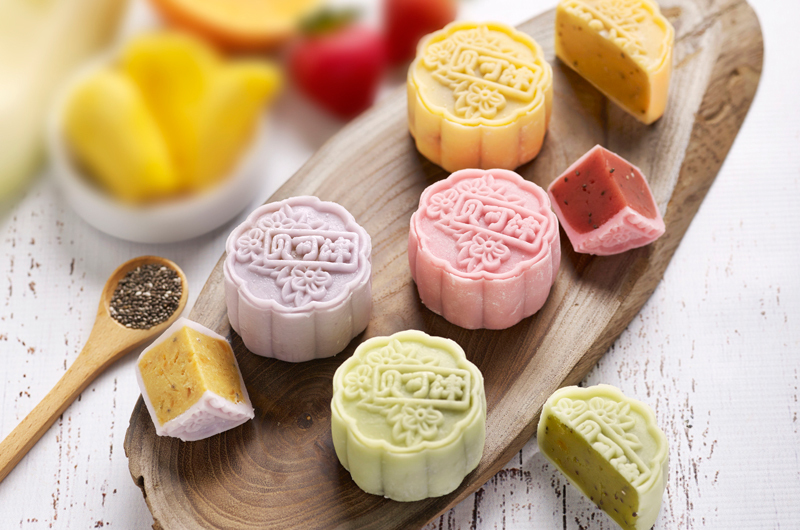 Reach for Häagen-Dazs’ extraordinary range of ice cream mooncakes. These folks have five different sets for you to choose from: the Lune et Etoiles, the Twinkle Twinkle Night Mix, the Mochi Collection, the Crispy Collection, and the LINE Friends Collection. 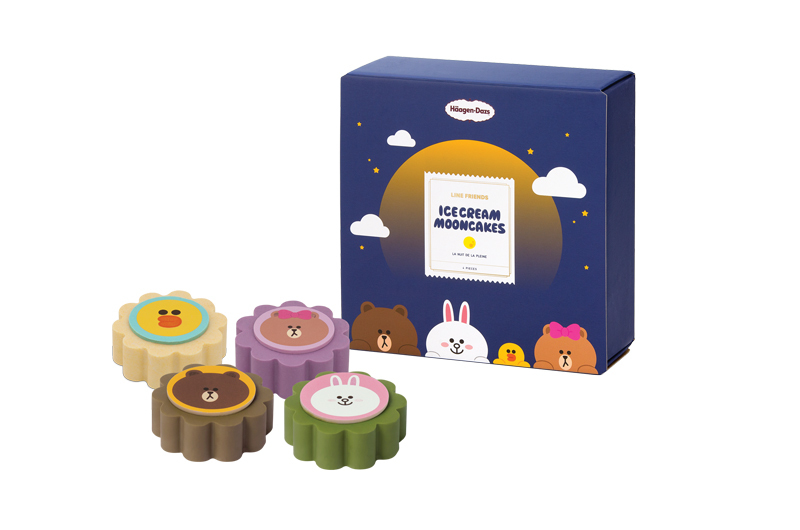 The latter will be a hit with the kids, showcasing four delicious fillings with the adorable LINE Friends gang emblazoned on top. The mooncakes are available for purchase from Häagen-Dazs outlets, Tangs.com and selected mooncake booths. Celebrate Mid-Autumn Festival in true kawaii fashion with sweet offerings from Hello Kitty Orchid Garden. This year’s selection features delicious ice-cream and traditional styles, from Pink Passionfruit Punch’s citrusy tang, Butter Me Up with its rich salted butterscotch ice-cream and crunchy cookie crumble, and Over The Moon, the café’s popular traditional baked mooncake. 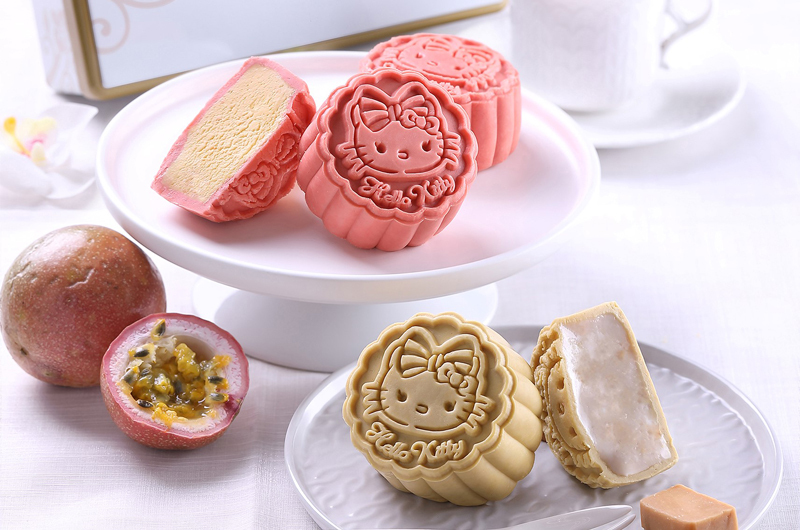 And, each mooncake comes embossed with Hello Kitty herself – a cute element that kiddos will surely love. The mooncakes are available for purchase from now till 24 September 2018 (while stocks last) at Hello Kitty Orchid Garden. Low in sugar yet highly delicious, Xin Cuisine Chinese Restaurant adds to its growing repertoire of healthier mooncakes with the refreshing Low Sugar White Lotus Paste with Orange Praline Mooncake and Low Sugar White Lotus Paste with Hazelnut Crunch Mooncake, which features a chocolate centre packed with crunchy hazelnut. Prefer more indulgent tastes? Explore the restaurant’s existing baked and snowskin collection. We recommend Xin’s Peranakan Durian nowskin Mooncake with luxurious durian filling encased in Blue Pea flower coloured skin, or Xin’s Signature Mini Egg Custard with Yolk Mooncake, which is topped by edible gold leaf for extra ‘wow’ factor. The mooncakes are available for purchase and collection at the Hotel Lobby from 27 August 2018, as well as twelve other locations island-wide. Enjoy exclusive discounts when you purchase online or call 6731 7173 for more information. Paying homage to its ideology of reimagining Chinese fine dining with traditional techniques and modern concepts, Madame Fan’s curation of traditional and snowskin mooncakes feature creative and contemporary flavours for the whole family. The highlight of the range is definitely Madame Fan’s Signature Champagne Chocolate – encased in a chocolate shell filled with rich dark chocolate ganache and buttery soft champagne snow skin. 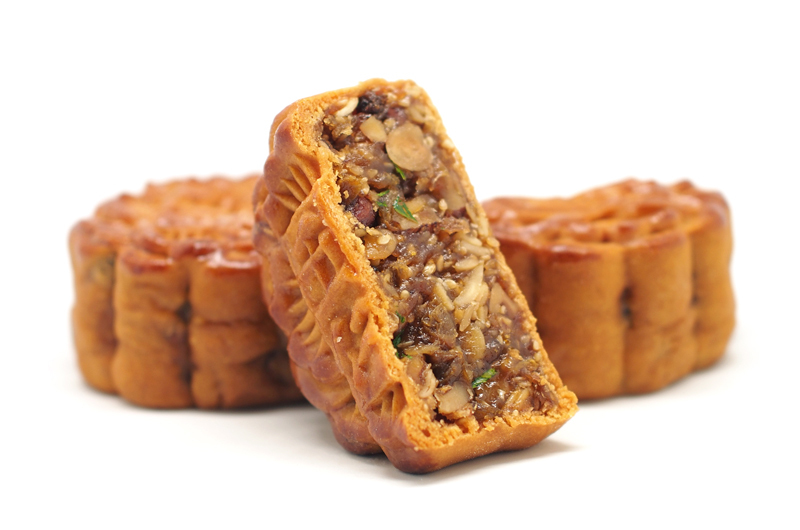 A close second is its Baked Five Coarse Grains mooncake that delivers a delightful crunch with every bite. The mooncakes are available for purchase from now to 24 September 2018 from JW Marriott Singapore South Beach Festive Counter at Level 1, at Madame Fan, Level 2 of The NCO Club, or online purchase at madamefan.sg. Call +65 6818 1908 or email [email protected] for more information. Opting for an array of traditionally baked mooncakes, Peach Blossoms’ 2018 collection features well-loved traditionally baked signatures and a new flavour, the White Lotus Paste and Charcoal Black Sesame Paste with Pine Nuts Mooncake. Apart from offering regular- and mini-sized mooncakes (great for kids to nibble on), its intricately designed boxes are definitely worth a highlight. If you’re a sucker for good packaging like us, you’ll appreciate how each individually boxed mooncake can be pieced together to showcase a beautiful painting of orchids, willows and birds, which peeks through champagne-framed transparent lids. Tip: for extra Mid-Autumn Festival fun, challenge your kids to upcycle the lids into fun photo frames! The mooncakes are available for purchase from now to 24 September 2018. You can order online at www.meritushotels.com/marina, call (+65) 6845 1118, or email [email protected]. 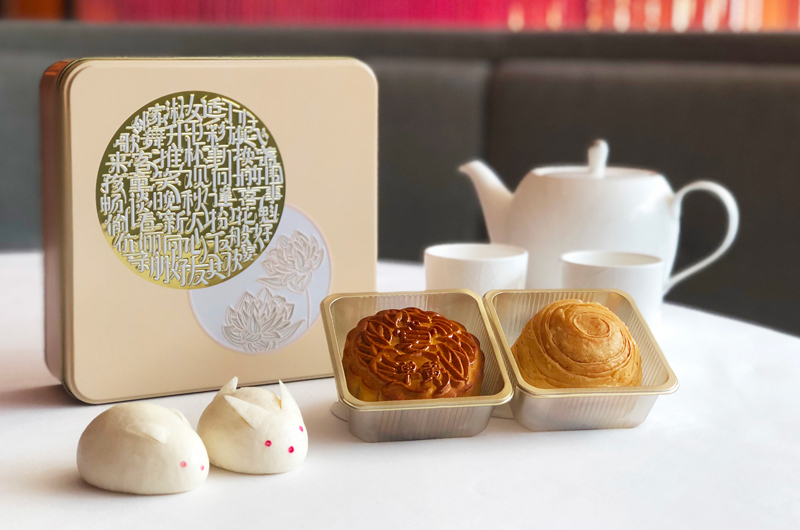 Fans of the legendary Raffles mooncakes rejoice, for these handcrafted goodies will still be available even with the hotel’s ongoing restorations. 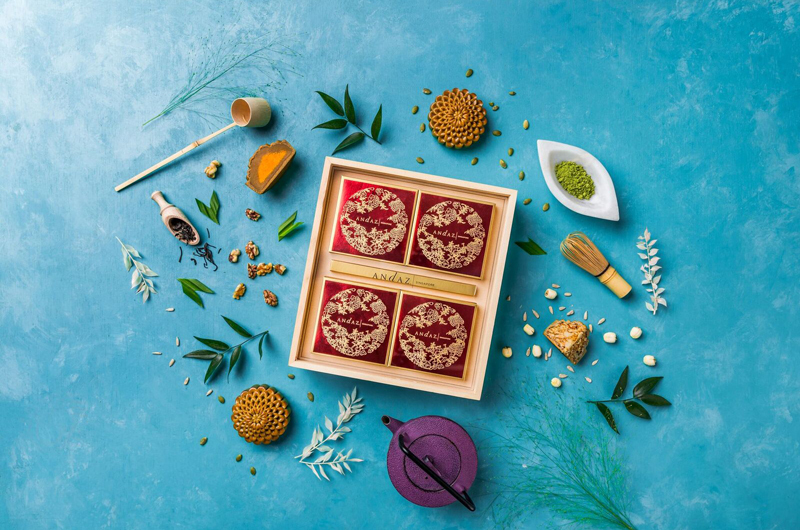 Apart from perennial favourites like the delectable Champagne Truffle Snow-Skin Mooncake, Earl Grey Tea and Cognac Truffle Snowskin Mooncake, look out for their latest Acai Berry and chia Seeds Snowskin Mooncake. Made with anti-oxidant rich acai berry and interlaced with organic chia seeds and Greek yoghurt, this confectionary is packed with nutrition. Healthy and delicious mooncakes? Sign us up! The mooncakes are available for purchase and collection from now to 24 September at Raffles Hotel Singapore. Call +65 6412 1122 or email [email protected] for more information. French luxury meets local tradition in Sofitel Singapore City Centre’s inaugural selection of limited edition mooncakes. Titled Les Fleurs de Lumiére Mooncake Collection (The Flowers of Light), it comprises four distinctive traditional mooncake flavours blending ingredients such as foie gras and truffle oil in The Luxe mooncake, to traditional Asian ingredients in The Oriental mooncake. Even more impressive is the collection’s artisanal box design, which features an exclusively commissioned art piece by Ariana Caroli, renowned Italian painter and Sofitel Singapore City Centre’s Artist-in-Residence. Great on the eyes and the taste buds! The mooncakes are now available for purchase. To order, call +65 6428 500 or place orders online here. 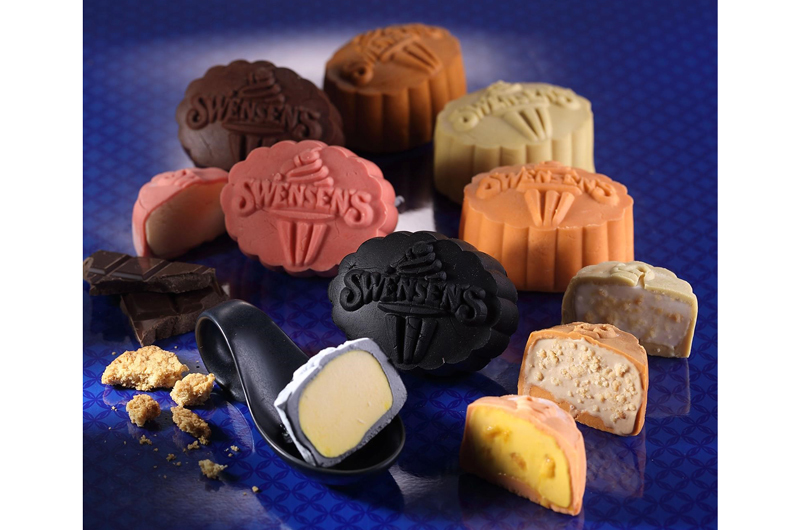 Expanding its unique line-up of oval-shaped mooncakes, Swensen’s debuts five yummy ice-cream flavours, Sedap Chempedak; Feel Good Passionfruit; Wild Floral Honey Crumble; Salted Butterscotch Crumble; and Mao Shan Wang, alongside its signature Sticky Chewy Chocolate. If you’re looking for family-friendly mooncakes that the kids will definitely love, Swensen’s Mid-Autumn mooncake collection is your best bet. The mooncakes are available for purchase from now to 24 September 2018 at all Swensen’s and Earle Swensen’s outlets. Online orders are also available at www.swensens.com.sg from now to 9 September 2018. An oldie but a goodie, Pine Garden’s confectionaries have a special place in our hearts, and their mooncakes are no exception. This year, the heartland-boutique bakery debuts seven stunning flavours alongside classic favourites such as Snow Skin Lychee Martini White Lotus Paste and Baked Skin Red Bean Orh-ni Mooncakes. Think sticky-chewy Coconut Dodol jazzing up jade-green Pandan, bittersweet chocolate custard filled with brownie pieces and marshmallows, and tangy yuzu white lotus seed paste interspersed with pop rocks and candid citrus peel – need we say more? The mooncakes are available for purchase at all Pine Garden outlets and kiosks. Call +65 6457 6519, email [email protected] or visit www.pgcake.com for more information. Take your pick from Ritz-Carlton’s luxurious selection of snowskin and traditional bakes. 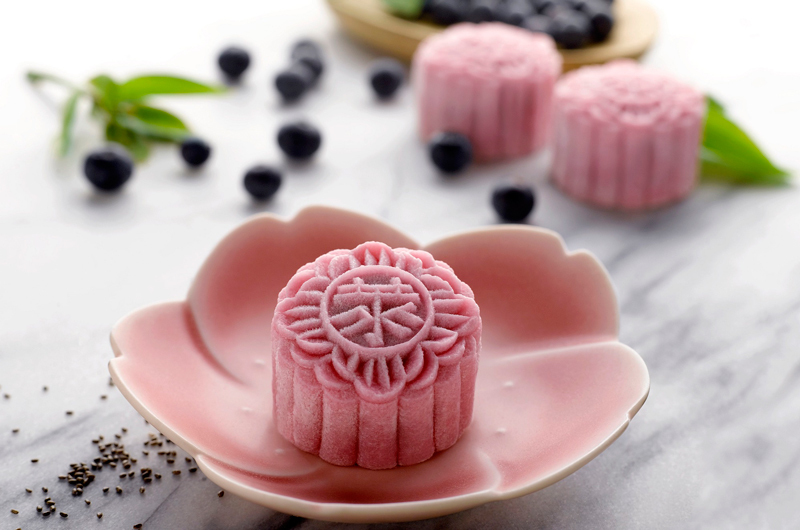 Making its debut this year is the White Lotus Seed Paste with Red Date and Longan mooncake, which combines two popular Chinese tea ingredients for a full-bodied and textured taste. For those who enjoy bite-sized mooncakes, chow down on the hotel’s signature Assorted Mini Snowskin Martini mooncakes – which include Irish Martini and Lycheetini – or the Mini Snowskin ‘Mao Shan Wang’ Durian mooncakes that’ll definitely appeal to durian aficionados. The mooncakes are available for purchase from now to 24 September 2018. Make your order online at www.remooncake.com.sg or at various retail locations islandwide. 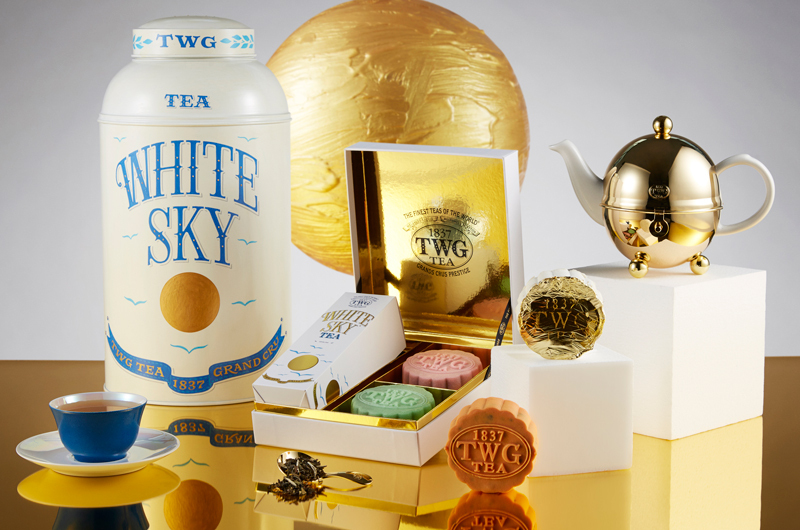 Sipping tea while nibbling on mooncakes are a given, but TWG Tea’s brand of tea-infused traditional and snowskin mooncakes takes center stage at any Mid-Autumn gathering. Aptly named the White Sky Tea Mooncake Collection, their creative line up of fresh seasonal pastries include Chocolate Tea-infused white lotus paste and chocolate chips, Chestnut and white lotus paste inflected with Okyati Tea, and a show-stopping white satin snowskin mooncake embellished with precious gold leaf encased in a smooth white lotus and lemon paste. The latter is inflected with the fruity and flowery notes of White Sky Tea, revealing a heart of lotus cream that even the kids will enjoy. 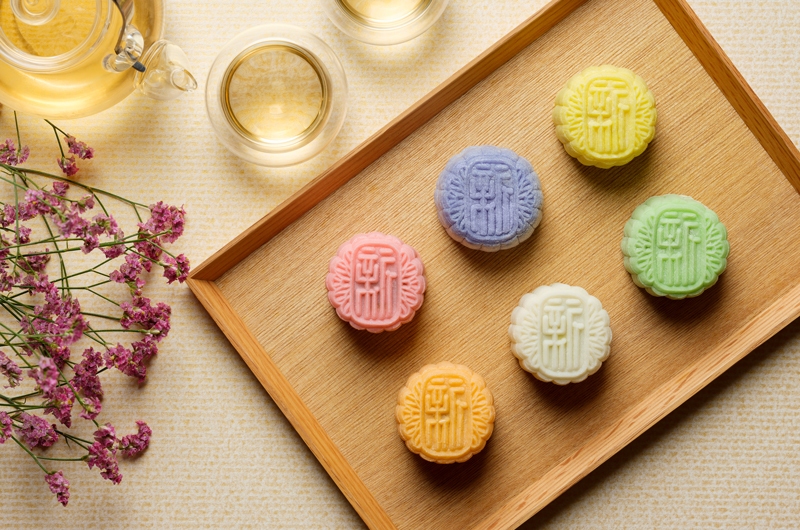 The mooncakes are available for purchase from now to 23 September at TWG Tea Salons and Boutiques. Visit www.TWGTea.com for more information. Enjoy a special 15% discount when you order the mooncakes online. 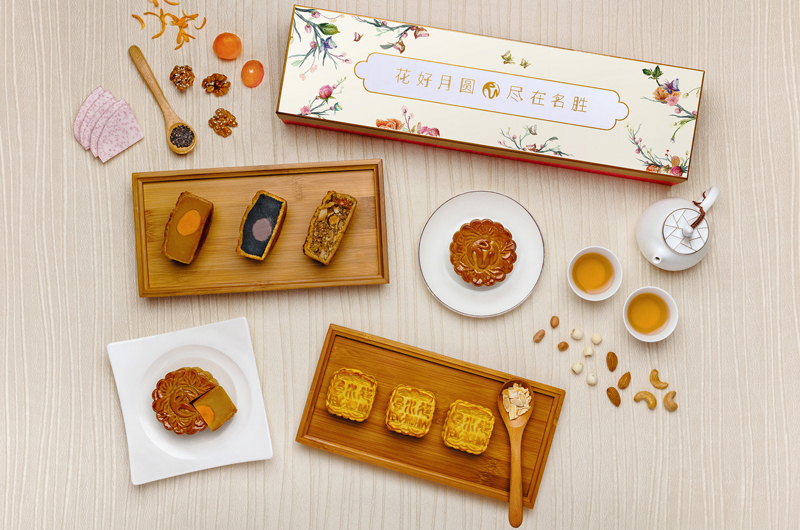 Yàn upholds the Mid-Autumn tradition with a timeless collection of mooncakes with white lotus or yam paste filling. While the adults gather round with a good cuppa tea and yummy mooncakes, the little ones will appreciate the fragrant rabbit-shaped custard steam bun that pays homage to the mythical rabbit on the moon. Take the opportunity to share the popular folklore tales with your child! The mooncakes are available for purchase and collection from now to 24 September 2018 at Yàn. Call +65 6384 5585 or email [email protected] for more information.